You don’t have to dig very deep on URC Psalmody to find references to the Psalter Hymnal. From blog icons to articles to videos, you’ll notice that the “blue book” is mentioned anywhere and everywhere. But if you’re new to the Reformed tradition of worship, you may be wondering: What exactly is the Psalter Hymnal, and why is it given so much attention on this blog? In a simple question-and-answer format, let me attempt to present a brief introduction to this important songbook. What is the Psalter Hymnal? Although the URC looks forward to the creation of its own denominational songbook in the near future (see the URC Psalter Hymnal page), the vast majority of its churches currently use the blue-covered 1959/1976 edition of the Psalter Hymnal of the Christian Reformed Church (CRC). It is this hymnal that comprises most of the content under discussion on URC Psalmody. What other Psalter Hymnals are there? The first edition of the Psalter Hymnal was published by the CRC over 75 years ago, in 1934. According to my knowledge, a second edition was published in 1935 and 1951. For the most part, the selections in these earlier editions are the same as those in the Psalter Hymnal we are familiar with. The edition used in the URC, sometimes called the Centennial edition, was published in 1959 and 1976. More recently, in 1987, the CRC published yet another edition of the Psalter Hymnal with a gray cover (which may be familiar to some as well). Many things about this version are drastically different from all previous editions. Generally, the psalm and hymn settings are less accessible and more contemporary. Specifically, the changes include modernized lyrics, gender-neutral tendencies, elimination of the name “Jehovah”, and musical alterations such as lowered keys. Where are these Psalter Hymnals available? 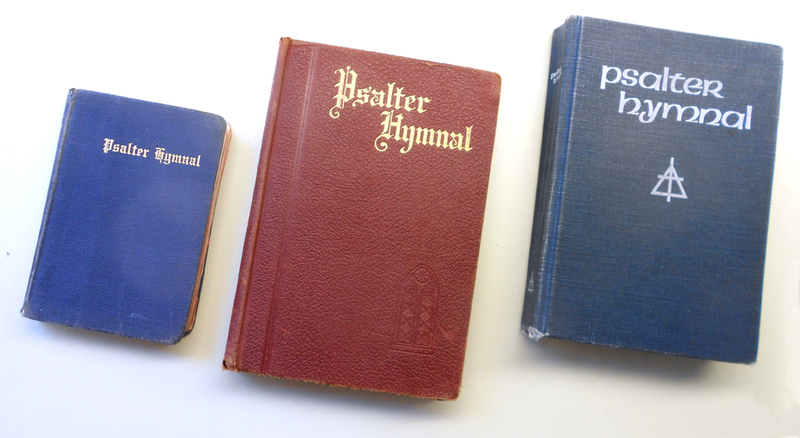 To my knowledge, 1934, 1935, and 1951 editions of the Psalter Hymnal are scarce, though it shouldn’t be too hard to dig one up at a used bookstore somewhere in Grand Rapids. The 1976 Psalter Hymnal, though not directly available from the CRC, is still available from Reformed Fellowship, Inc., here. The 1987 Psalter Hymnal is still published by the CRC and is available from Faith Alive Christian Resources here. How is the Psalter Hymnal related to other songbooks? While the Psalter Hymnal is used primarily today by the United Reformed Churches in North America, its selections are familiar in a wide range of denominations. The 1959/1976 Psalter Hymnal also includes a handful of selections from the old Scottish Psalter, especially well-known in churches with a Scottish heritage. The majority of its psalm section, however, is derived from the Psalter of 1912, published by the United Presbyterian Board of Publication, and still used today by certain denominations like the Protestant Reformed Church. As a descendant of the 1912 Psalter, the 1959/1976 Psalter Hymnal is also a close cousin to many other Reformed and Presbyterian psalters such as The Book of Psalms for Worship (and its siblings), Sing to the Lord, and the Trinity Psalter and Hymnal. If you recognize any of these names, chances are you’ll feel right at home as we discuss setting the psalms to music. Now that we’ve looked at the background and significance of the Psalter Hymnal, another extremely important question could be raised: How should we treat the Psalter Hymnal–should it define our worship or merely contribute to it? Admittedly, this hymnbook–any hymnbook, for that matter–has the tendency to stir up controversy in denominations such as ours. Thus, here are a few of my own thoughts on the proper treatment of the Psalter Hymnal for your consideration. The Psalter Hymnal isn’t infallible. Might it be true that sometimes, when we become extremely familiar with an object and realize its immense value, we begin to assume it is perfect? On occasion, I have heard the blue Psalter Hymnal so staunchly defended that one would almost think it to be the inspired Word of God! How far from the truth. This hymnbook has its share of flaws, inconsistencies, and problems just like any other human work. I bring this up only to clarify that as much as I (and you) discuss the contents of the Psalter Hymnal, we are still working with a creation of man–beautiful, but by no means perfect. This book is flawed, as just mentioned, but what riches it still contains! Beautiful, singable settings of psalms are hard to come by, especially in modern times, and I believe we are truly blessed to have such a collection at our disposal. The blue Psalter Hymnal and the editions before it are unique in their approach, combining familiar, easy-to-sing melodies with solid, well-structured metrical versions of the psalms. And these settings constitute a part of a rich heritage: many of them were in use by our Reformed predecessors as long as 100 years ago! I am continually amazed at the wealth of good psalm settings within the Psalter Hymnal, and I hope that you can share in this excitement through this blog. Due to its focus, URC Psalmody contains a wealth of additional resources related to the Psalter Hymnal. Check the Resources page regularly to find more!